I don’t like tunnels. 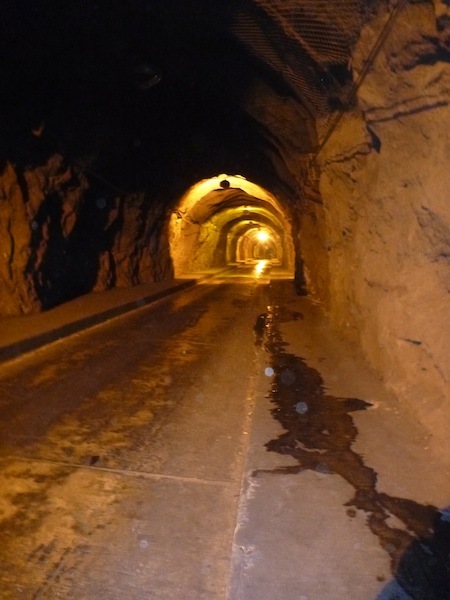 Unfortunately, to get in/out/around Guanajuato the long, dark, narrow, winding – often unlit – tunnels are unavoidable. On a bicycle in such a tunnel, climbing up a steep hill at 8kph, you feel extremely exposed and vulnerable. 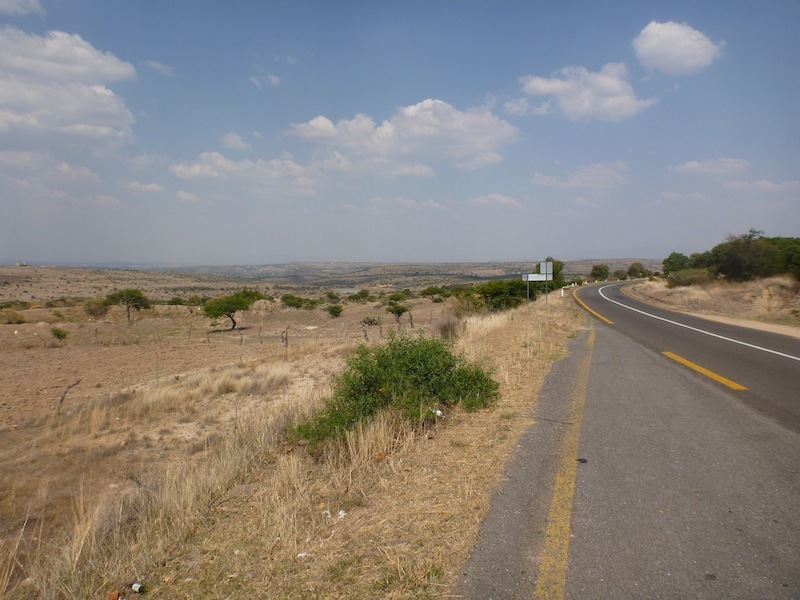 As a result, entering Guanajuato on bicycle was a pretty stressful experience. The stress though, is worth it. 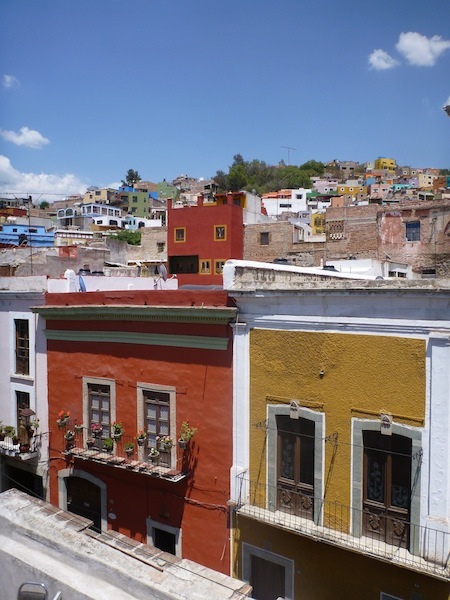 After ducking and weaving your way through the mountains you suddenly round a bend, and there it is: Guanajuato is all its splendour. 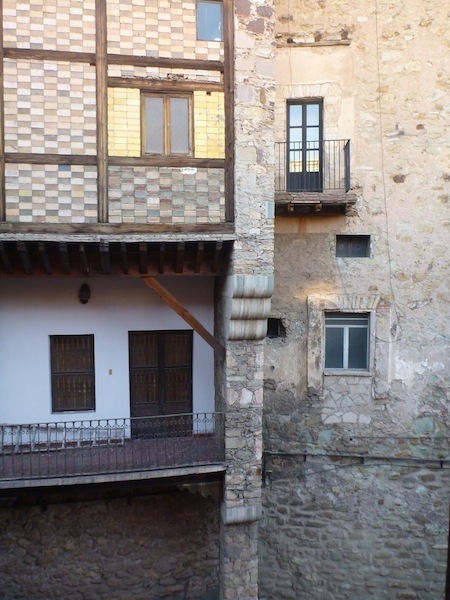 The view is Medieval: Colonial architecture abounds, cobbled streets prevail, old dilapidated yet dignified houses are stacked on top of one another like a precarious house of cards, and the concept of “straight” has yet to have been invented. Roads curl into themselves, buildings sag with the oppressive weight of time, the plazas lack the usual symmetry, people sway and stagger past each other on the narrow walkways, even the clothes the street musicians wear abound with voluptuous tangents of freak-flag-flying puffy cloth. 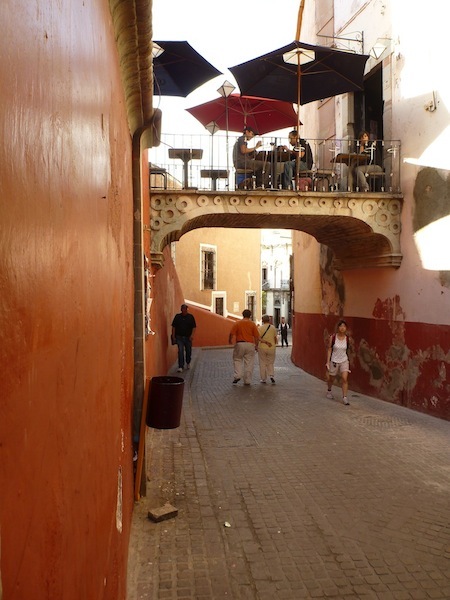 Walking around Guanajuato is like being transported into another time and place, the feeling is more akin to traipsing around small town italy in the 1700s as opposed to 21st century Mexico. It’s a beautiful place, full of earthy colours that come alive as the suns drops into the mountain tops. 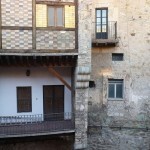 It is far too easy to lose yourself as you wander the narrow alleys and lanes. No seriously, you will physically get lost, take a map. It’s also a lively place. 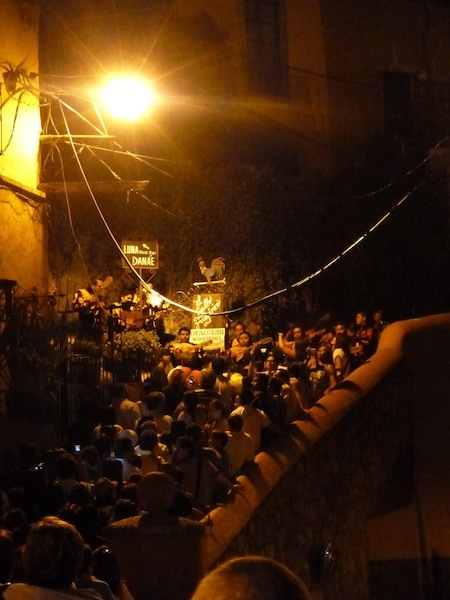 Throngs of locals and mexican tourists throng the streets, along with the occasion sprinkling of gringo, and at night – after the oppressive heat of the day – the place comes alive. Troupes of musicians in old school medieval bard attire traipse around the streets closely followed by a parade of happy boisterous spectators: They put a halt to their traipsing at opportune locales and turn to serenade their fans with a song or two. In the squares, mimes and other street performers are at work, and I even heard there was some sword dueling taking place. 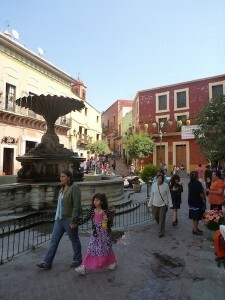 All in all, Guanajuato has una buena onda – a good vibe. 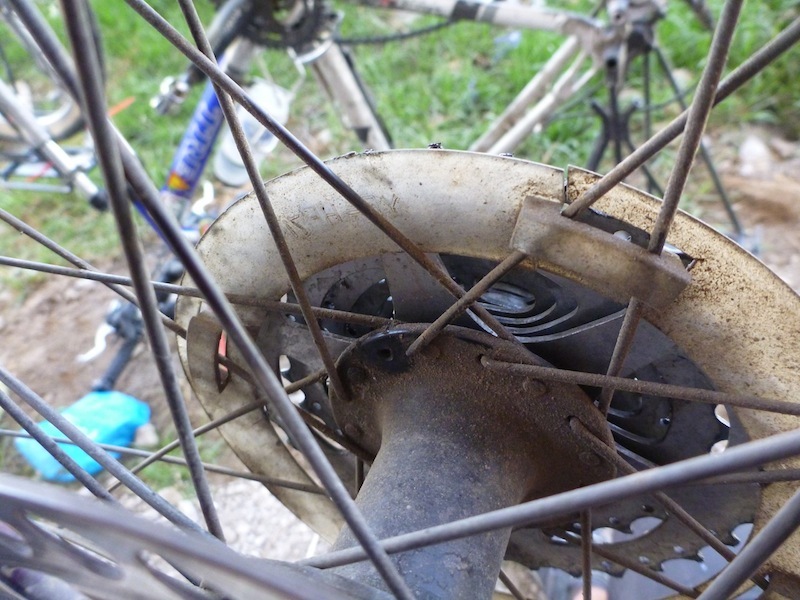 Traveling by bicycle combined with an intense desire to continue improving my spanish has in many respects pulled me away from the traditional tourist trail; you might say that I have been doing my best to avoid english speakers and to instead stick with the locals. As a result, before Guanajuato, I had had almost zero contact with the traditional backpacking community. 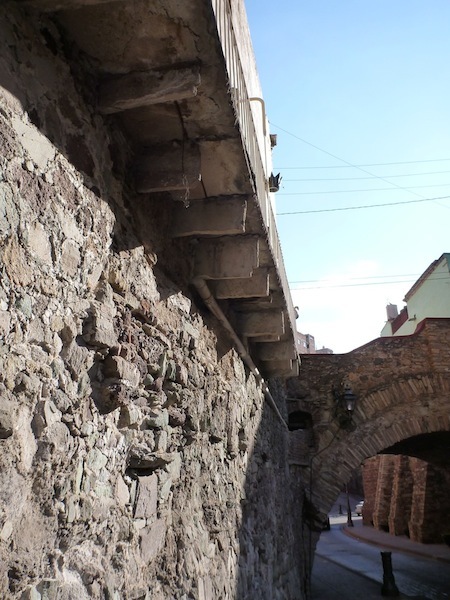 Clearly though, Guanajuato is on the Gringo Trail – the path through Latin America heavily beaten by foreign tourists and backpackers. 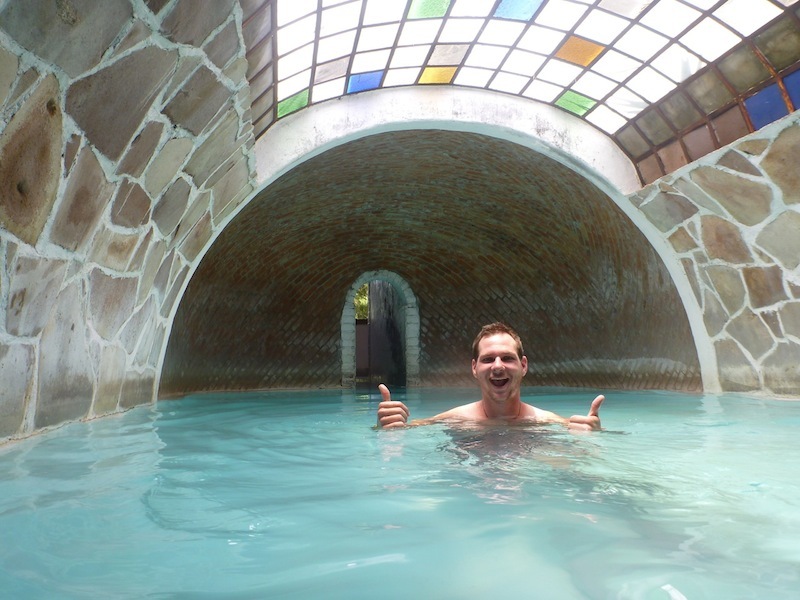 I stayed in my first Mexican hostel in Guanajuato (second hostel for the entire trip) and it was interesting/fun for me interacting with the few fellow travelers that were about. 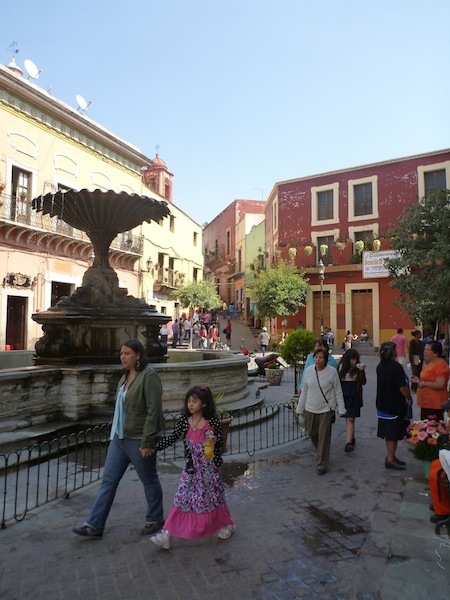 This experience continued as I moved on to San Miguel de Allende, a cute colonial town with a vibrant arts and crafts scene and large expat community (10% gringo). I stayed in another hostel there and all together I met a swiss woman who was in San Miguel to learn more about working silver, a Japanese girl who had been living in Mexico for 5 years, a talented young filmmaker from Quebec, an older British lady who said she was originally from Iraq,a dutch truckdriver, a girl from Melbourne, Australia, a Spanish guy moving to Mexico, and a bunch of Mexicans traveling in their own country for various reasons. For this week I got to hear non-cyclist, non-mexican, and non-expat impressions of Mexico. I got to listen to what draws travelers to this fantastic country for their three week or three month holiday and I got to hear about the places they had been to. 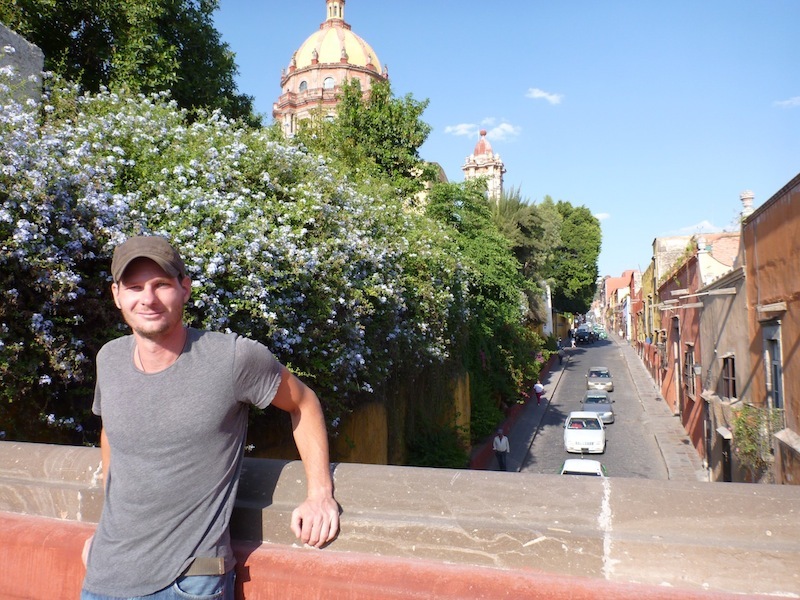 Everyone was coming from distinctly different lives and had a different story of how they had come to travel, and how they had ended up in Mexico. 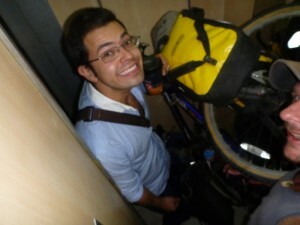 It was inspiring for me to hear those stories – particularly as my work on ZackPacking.com continues to slowly progress. As much as I enjoyed touching base with the traveling community. 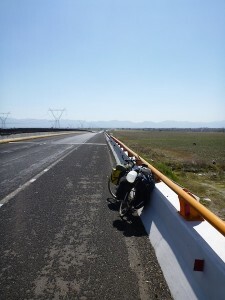 I was looking forward to getting back on the road to Mexico City as I had lined up some couch-surfing hosts in Queretaro and San Juan Del Rio. I wasn’t going to stay long in either place, but they would conveniently save me from camping and serve to break up the final 320km or so. 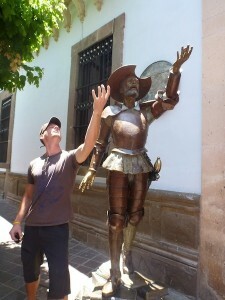 More than anything, after a week of speaking more english than spanish, I was keen to get back in with the locals, and indulge in the unique delights that couch-surfing provides I explain a bit about couchsurfing in this post. In Queretaro, a city with a beautiful quiet colonial centre, I stayed with David (who is actually from Belgium) who warmly welcomed me into his home for a couple of nights. I spent my day in Queretaro wandering between the innumerable fountained plazas, reading El Pais and El Universal, trying Queretaro beer, and napping on shady park benches. Later that night, I ended up going with David to a friend’s house for my first Mexican house party. Almost everyone at the party was an artist or graphic designer, and almost everyone was gay, so it was hardly what you might call a “typical” demographic, but it certainly was a good opportunity to get to know some very interesting people. The next night I was in San Juan Del Rio and stayed with Munir and Fernanda, an awesome couple who have just bought their first house together. To celebrate, these two very kind and generous people took me to a cute colonial town nearby called Tequisquiapan and insisted on treating me to nice dinner. 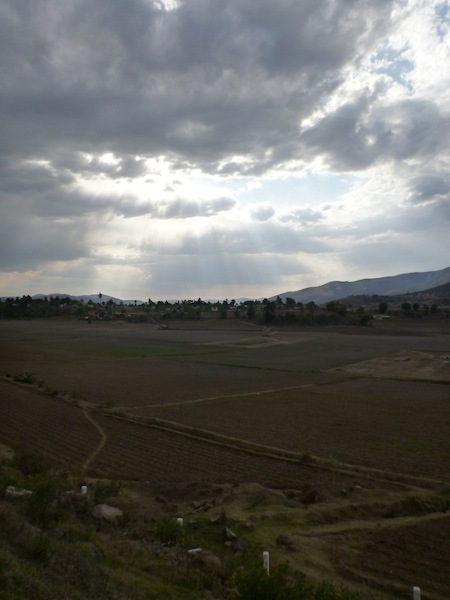 They also extended to me the hospitality of their friends and family in other cities in Mexico. Wonderful people. I hope to see them again in D.F. 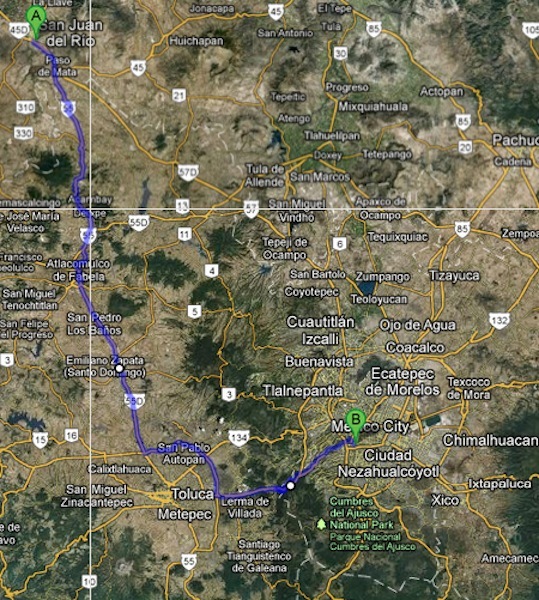 From the beginning of this trip, everyone has told me, “Don’t ride into Mexico City, take a bus, it’s too big, it’s huge”. 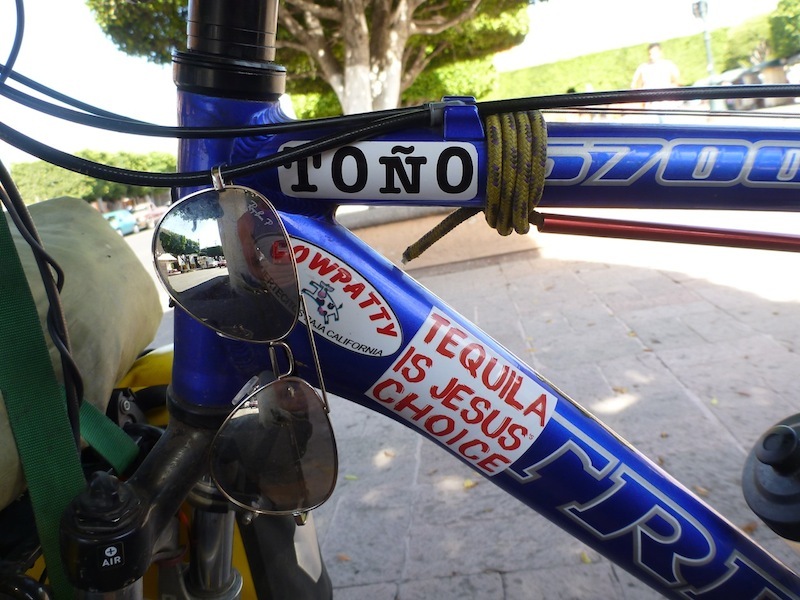 Everyone: cyclists, tourists, and Mexicans alike. They have a point: with 25 million people, Mexico City is the largest city in the whole of the western hemisphere. It’s not just big or huge, it’s bloody enormous! But that isn’t the only reason why riding into Mexico City is a bad idea. The other reason is the mountains. 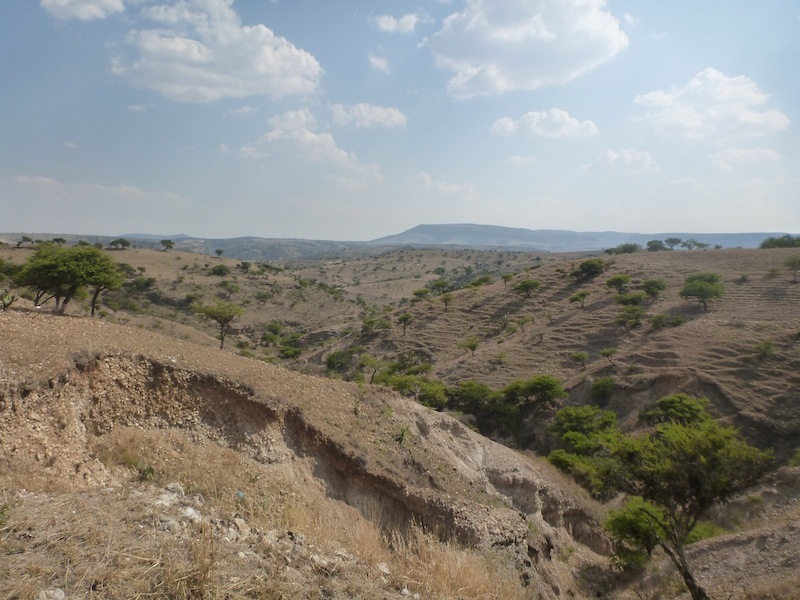 Mexico is located in the Valle de Mexico and is pretty much surrounded on all sides by mountains, the highest of which peak at over 5400m and happen to be active volcanoes. So no matter what direction you plan to storm the city from, you had better be prepared to do some climbing. As you probably have surmised, every time someone warned me about the city’s size, the traffic, the pollution, and the mountains, all I heard was “CHALLENGE! CHALLENGE! CHALLENGE! 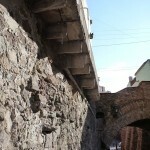 CHALLENGE!”. 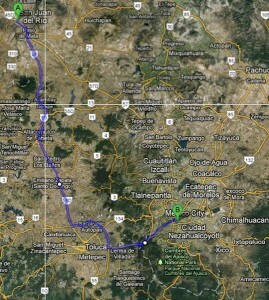 So it goes without saying that Tony and I were going to ride into Mexico City. 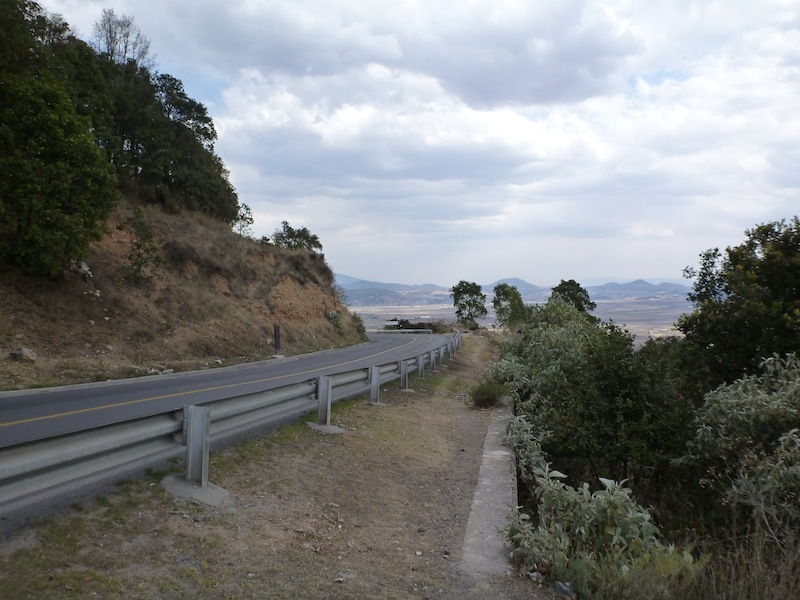 Riding around Toluca and seeing the final hurdle to Mexico City in the distance. approved. Leaving San Juan we were first going ride to Toluca, a city located directly west of Mexico City on the other side of the mountains and sitting on the highest elevated plains in all of Mexico – at 2600m above sea level. This meant that leaving San Juan we could get half of the climbing out of the way on the first day. 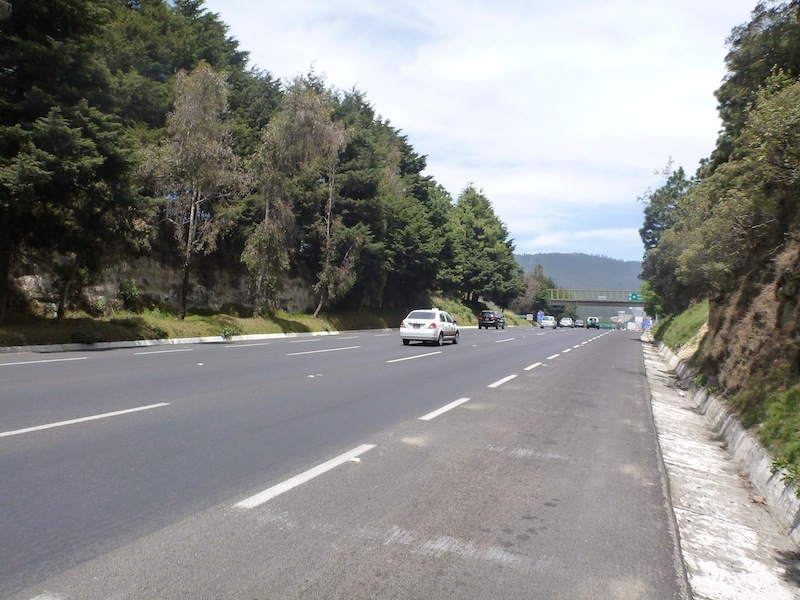 From Toluca, we would then turn our sights east for the city, and tackle the steep 600m climb up to over 3100m before descending down into the city. They plan went off almost without a hitch (Robert Falcon Scott, eat your heart out). 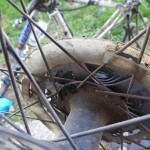 The only hiccup being the breaking of a drive-side spoke on our rear wheel (man-scout skills handled that one) the first day. The final big climb was no small chimichanga, but then Tony and I are no shrimp cocktail either and we just put the bike in low gear and slowly buzzed our way up it. Hold up – let’s put that last climb into perspective. 600 meters of elevation is a rather vague term. Imagine carrying 40 kg of gear up the stairs of the Empire State Building. Feel it? Good. Now, do it again and then you will have the right idea. From the top of the mountain it was then all downhill into the dense metropolitan jungle that I like to call The Big Taco. This also went smoothly as traffic is less of an issue when you are flying down the road at over 60 kph with the cars struggling to keep up. Finally, Tony and I rolled up to the outside of my friend Polo’s apartment building were we were warmly welcomed. We had arrived at last in Mexico City and at the official end of Stage 3 of the Tour de Zack (AKA Operation: Tequila! Tequila!). It had only taken us 71 days and 2,500 km. It's official, Tony has gotten his "nameplates" "Toño"